This thread documents issues with Wasteland 2: Director's Cut people have reported, and known work-arounds for them. We'll be keeping this up to date, so keep an eye out for new info! Wasteland 2: Director's Cut uses the newest Unity 5 engine DX11 renderer. If you have older graphics hardware which is below our minimum requirements or not fully DX10/11 compliant, you may get crashes while playing. We believe this is an AMD driver bug. We are currently investigating these crashes on certain AMD hardware, including R7 and R9 series cards. You can also add the "-force-d3d9" launch option to force the game to run in DirectX 9 mode, which might potentially improve stability for you, at the potential cost of performance and image quality. Wasteland 2: Director's Cut has certain system requirements. Playing the game on systems below these recommendations may lead to problems, crashes or performance issues and is not recommended. This includes hardware such as integrated graphics (i.e. Intel HD Graphics), pr older mobile graphics hardware, which are not supported. Framerate monitoring software, anti-virus software, overclocking software, etc. may conflict with Wasteland 2: Director's Cut and cause problems, especially when trying to display an overlay message on-screen. Software known to cause issues with Wasteland 2 includes EVGA Precision X, MSI Afterburner, Rivatuner, Dxtory, and more. Please disable such software if you're running into issues while playing. Editing save files, mods, etc. Mods and save editing are something we are absolutely happy to let players do - play the game your way and have fun! However, we must stress that if you edit save files or use mods and run into a problem, we may not be able to provide assistance. Editing save files and using mods can and may very likely break something, somewhere in the game for you. Mods which can cause problems extend beyond mods created specifically for Wasteland 2: Director's Cut. Using old Wasteland 2 vanilla mods will most definitely not work properly. Likewise, graphics mods such as SweetFX may not work either. 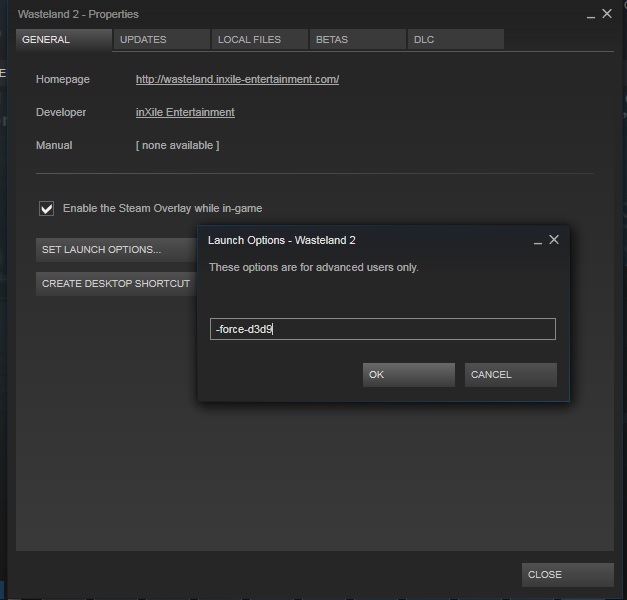 Save files with the vanilla version of Wasteland 2 will not work properly in the Director's Cut. While it is possible to copy them into your save folder for the Director's Cut manually, we advise not doing so as this could lead to problems and glitches during your game which wouldn't occur otherwise. Some users have reported that NVIDIA G-Sync can cause performance degradation on their systems. Please ensure you have the latest NVIDIA graphics drivers for your system, and also please make sure you enable G-Sync in your NVIDIA settings for both windowed and full-screen modes. This seems to resolve the issue.